I secured my helmet in place and tested the brakes. I don’t know a great deal about bikes but as long as the brakes work, I am usually happy. We made our way outside the shop and clipped our water bottles onto the frames and piled on sunscreen. Even though it was barely past 8 am, the temperature was already in the high 20s and rising. February is officially one of the “cooler” months in Bangkok but is still warmer than pretty much any day in the UK. After a mini safety briefing, our guide, Tom raised his hand in the air and set us off on our adventure. 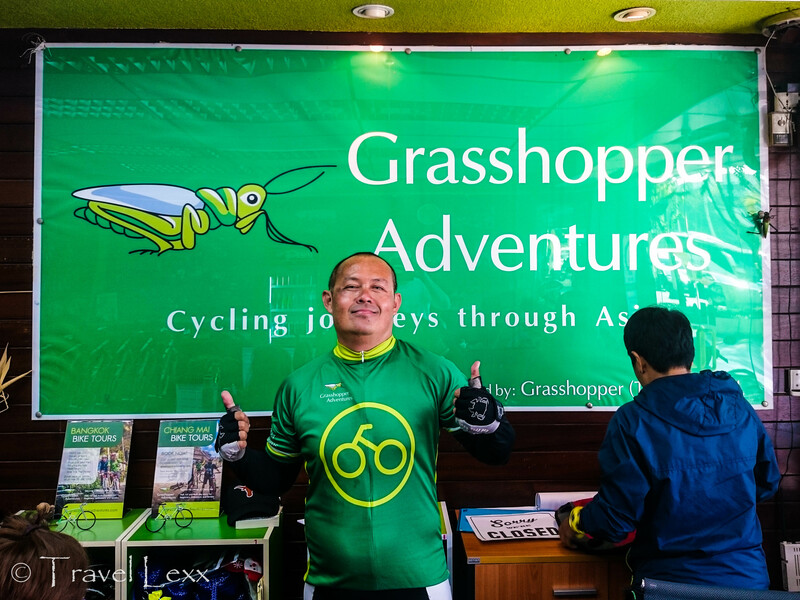 I came across Grasshopper Adventures bike tours a while ago and after visiting their offices the previous day, decided to book their Bangkok Trails trip. 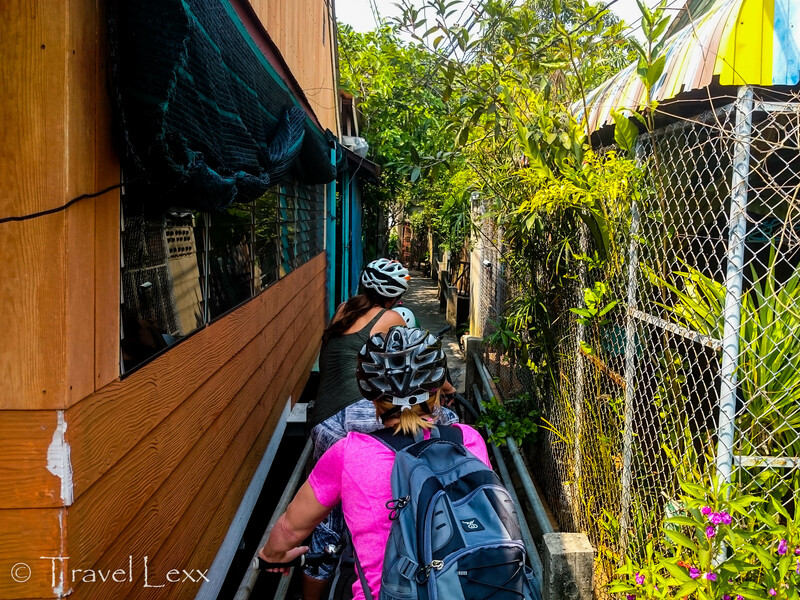 The focus of this tour was a ride away from the main sightseeing spots of the city, focusing instead on exploring small communities living on the outskirts of the city in the Nonthaburi province and riding past canals, farmland and ancient temples throughout the 40km route. We started off by cycling along the almost deserted Khao San Road, the famous backpacker hub still waking up after another late night of revelry. We dodged street cleaners scrubbing the pavements and first vendors setting up their stalls for the day ahead. 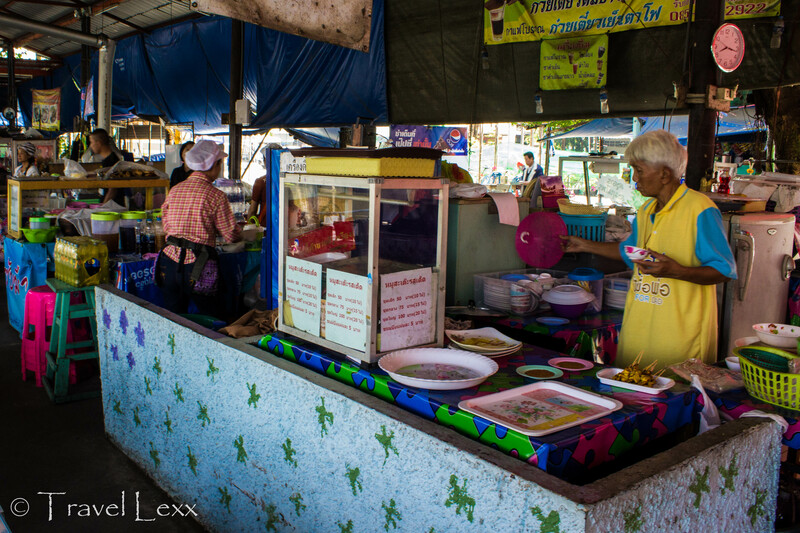 It’s Khao San as not many people know it – quiet, empty and neon-free. We crossed the ever-busy Chakrabongse Road, lined with bleary-eyed backpackers waiting for taxis and mini-buses to whisk them to the airport or the sun-drenched islands of the south. 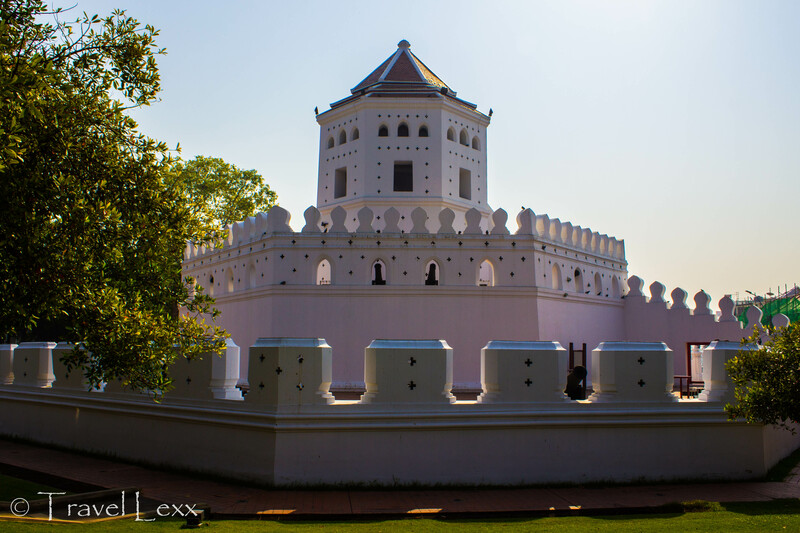 Our route took us towards the Chao Phraya and we paused to admire the views of the river and the 18th century Phra Sumen Fort, its watchtower the only one remaining from the 14 that formed the old city walls. 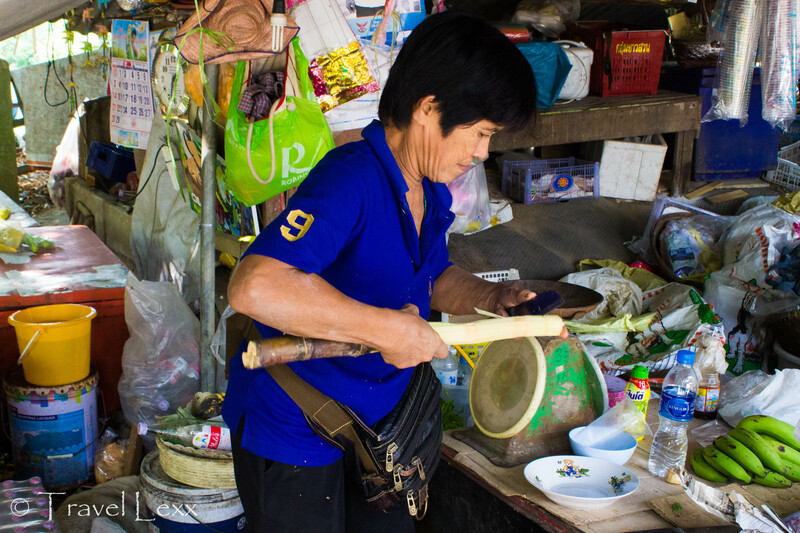 We continued on, navigating narrow alleyways and side streets, a few minutes away yet worlds apart from the bustling avenues packed with guesthouses, bars and 7-elevens. This was real Bangkok as locals smiled as we rode past, small family-run convenience stores beckoned from small doorways and Thai pop blasting out from open windows above. 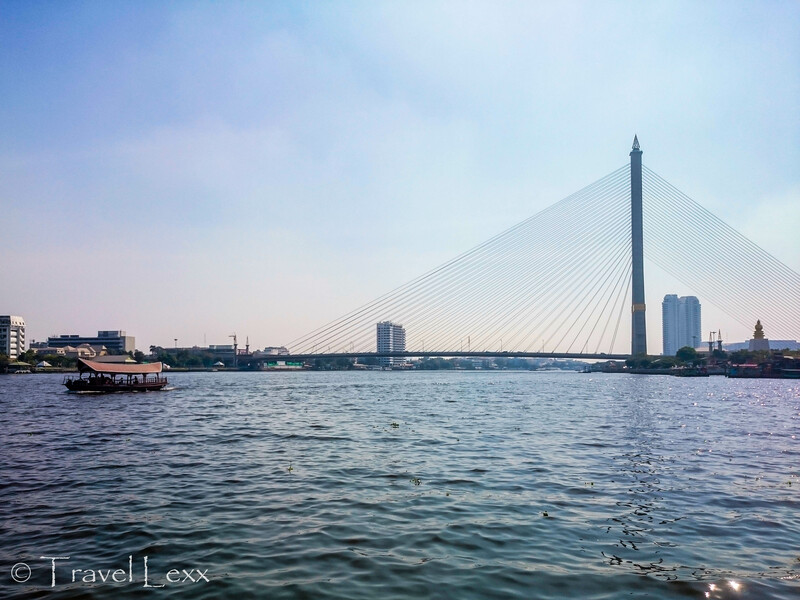 We crossed the imposing cable-stayed Rama VIII bridge, one of the biggest of its kind in the world, and made our way down quiet backstreets and through small neighbourhoods. 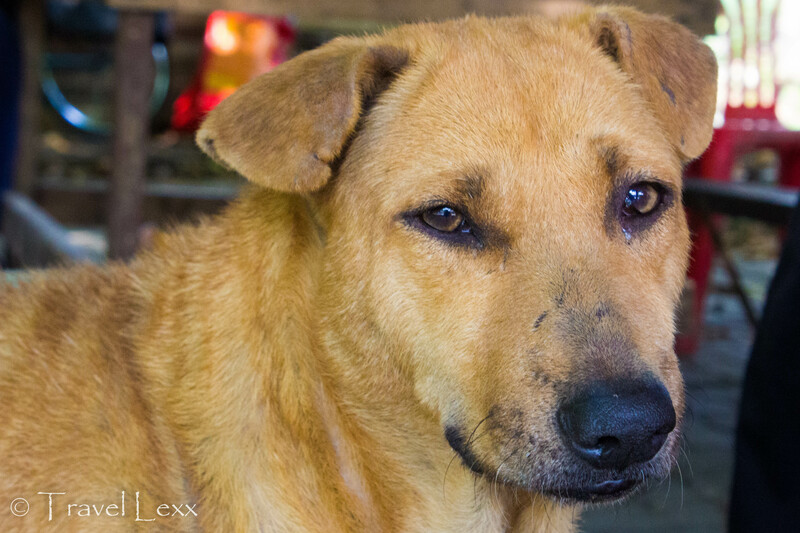 Food carts lined the streets and dogs slept in the shade to avoid the scorching sun. School children waved and cheered as we passed by. After a while, paved roads gave way to country lanes and narrow paths barely wide enough for a pedestrian, let alone a convoy of bikes trying to avoid mopeds zooming around corners. Clothes dried on lines between rusty rooftops and families cooked outside their modest homes. We peered into simply furnished rooms, catching glimpses of music videos and game shows on tiny old TVs. We had to keep one eye on the road, though, as those dogs seemed to love dosing right in the middle of the path! We met this beauty on the way! We continued over small bridges, down busy carriageways and alongside canals which help irrigate the green farmland here. Locals tended to their crops and the cows grazed contentedly nearby. 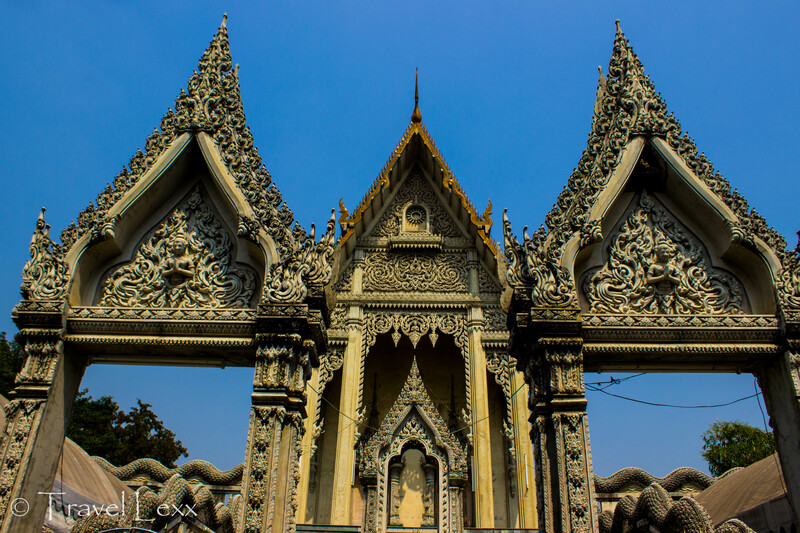 On the way we visited quite a few temples, including the impressive Wat Chalo. The temple is built in a style of a large swan boat, giving it an almost Viking-like appearance. We climbed to the chapel and took a closer look at the distinctive design. 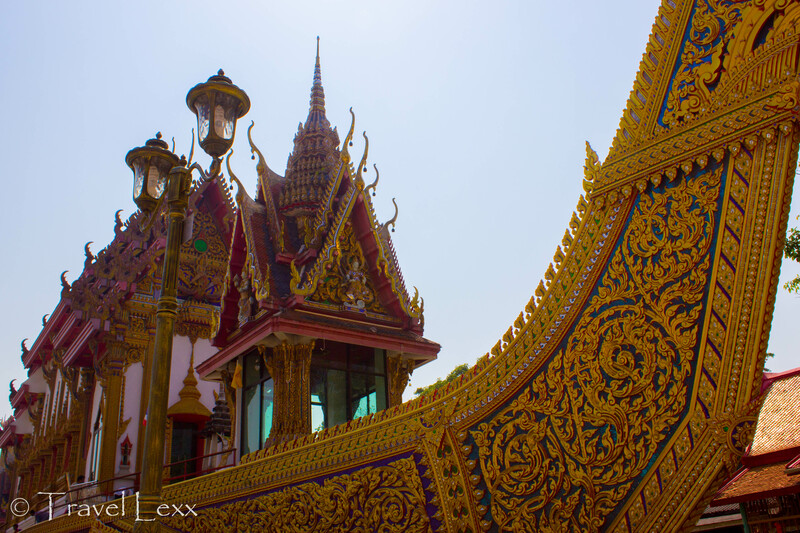 The temple is the largest of its type in the world and was built to resemble a boat to bring good fortune after a number of ships were lost in the nearby river. Tom taught us all about the life of monks in the temples as we tucked in to a tasty Thai lunch of spicy chicken and rice as well as delicious satay sticks. We walked to the river and bought loafs of bread to feed the giant catfish in the water below This supposedly brings good luck as well as being pretty amusing as throwing the food in resulted in a massive frenzy as the fish wrestled each other to get in on the action. We crossed the river and cycled between houses built on stilts, rising straight from the river and the canals. The paths got narrower and the drops into the water on each side steeper. I managed to barely avoid going for a swim with my bike and saved a daredevil chicken’s life with a hard squeeze of the brakes – I knew I was right to test them in the morning! A drinks break was soon in order as the humidity was making it hard to ride. We made our way to Wat Kaew Fah, a stunning white temple which is still being built despite looking like it could be centuries old! We climbed the steps flanked by serpents coiling along the balustrade and explored the raised platform and the unfinished chapel. We also tried our hand at making our own clay stamps with a hand-operated machine. We even got to take these home! We spent some time in the shade, enjoying freshly pressed sugar cane juice and delicious rose apples. Sugar cane juice made right in front of us! Roads turned into unpaved tracks as we cycled past rice fields, banana plants and swamps before starting to head back to the lively roads of the city. Before we knew it, we emerged back by the murky waters of the Chao Phraya, a ferry waiting to whisk us across the river with our bikes. Soon we were navigating the maze-like streets of Banglamphu, before cycling past the now-packed Khao San Road to the Grasshopper office. We arrived back exhausted but happy after spending 6 hours pedalling across areas of the city mostly unchartered by tourists. 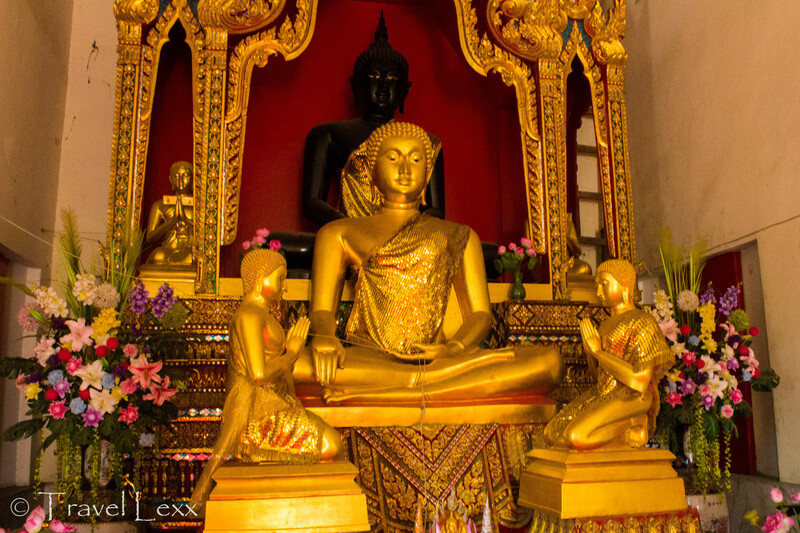 If you ever find yourself looking to get away from the skyscrapers and madness of the Thai capital, head a little off the beaten path to discover a Bangkok you didn’t know existed. 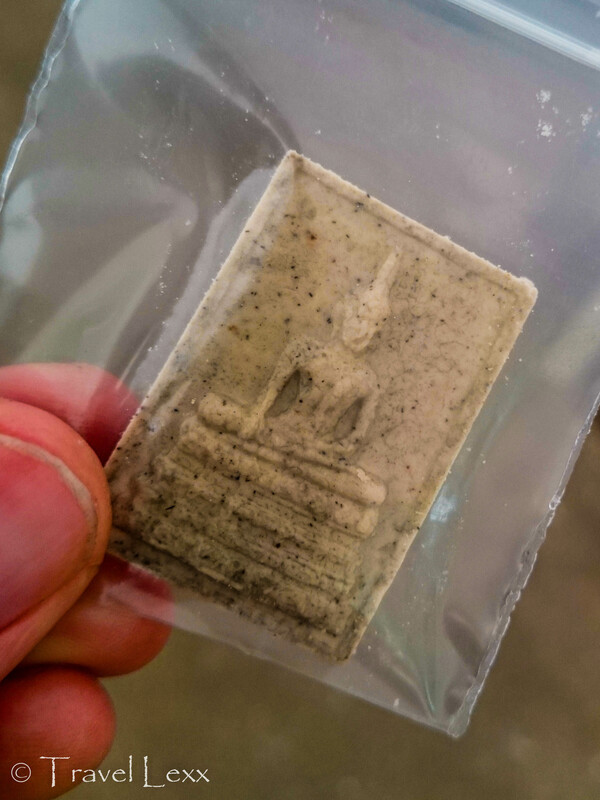 What: I did the Bangkok Trails tour (฿1700/£38/$50) with Grasshopper Adventures. They can be found at http://www.grasshopperadventures.com/ and offer a variety of tours across South East Asia. Their Bangkok office is just around the corner from Khao San Road on Ratchadamnoen Klang Rd. Who: Tom guides groups throughout the week and is absolutely amazing. Ask for him and say hello from me! Where: Bangkok is the capital of Thailand. Flights from major UK cities cost from £380. I flew with China Southern (http://global.csair.com/) with a short stopover in Guangzhou. Read my Guangzhou International Boarding Area review here. Getting there: Most tours depart from Grasshopper’s offices in Bangkok. 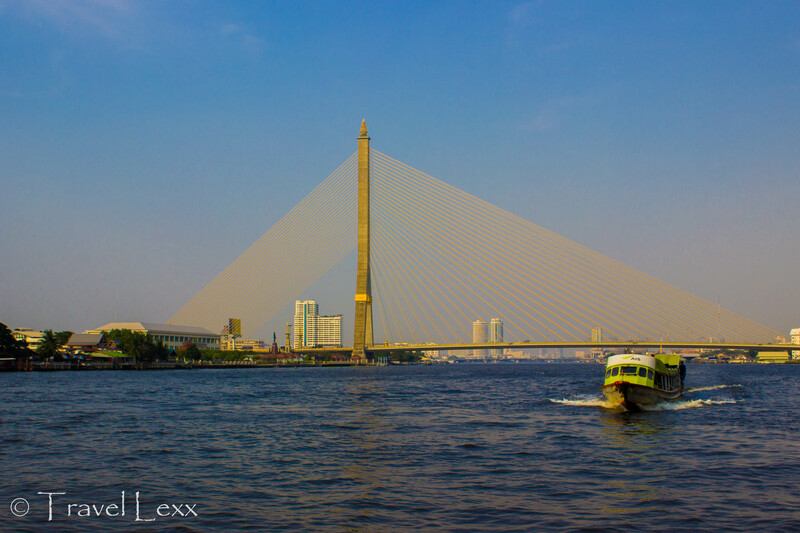 Take the Chao Phraya express boat (around ฿15) to Phra Arthit stop. 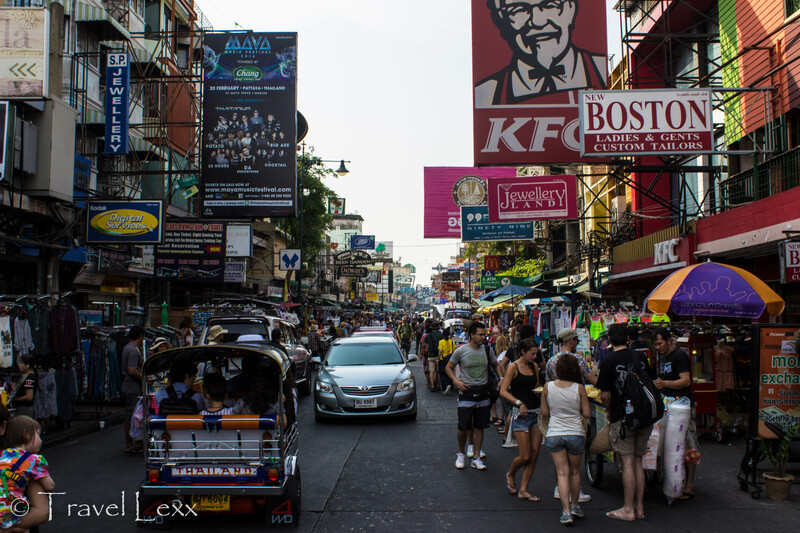 Khao San Road is a short walk away. At the end of Khao San, turn right on Thanon Tanao and walk to the big intersection. Turn left without crossing the road and Grasshopper will be on your left. Also Try: To read about my other cycling adventures in Bangkok, check out my Cycling Hidden Bangkok post. Note: This is NOT a sponsored post. I did not receive any payment or discount from Grasshopper Adventures. 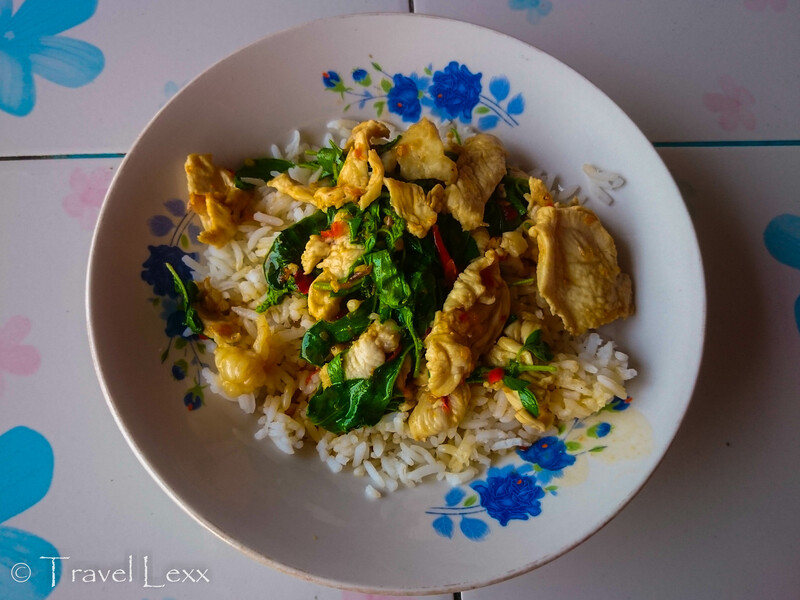 This entry was posted in Thailand and tagged adventure, bangkok, bike, cycling, grasshopper, khao san road, nonthaburi, temples, Thailand. This looks so cool! What great things you got to see and I’m so impressed that the tour was 6 hours! I’ve gone on a few bike tours lately and have struggled to adjust to bikes I’m not used to. It is such a great way to see the area you are in though and get some exercise too. And, I love the doggies snoozing in the road! Thanks – it was incredible. 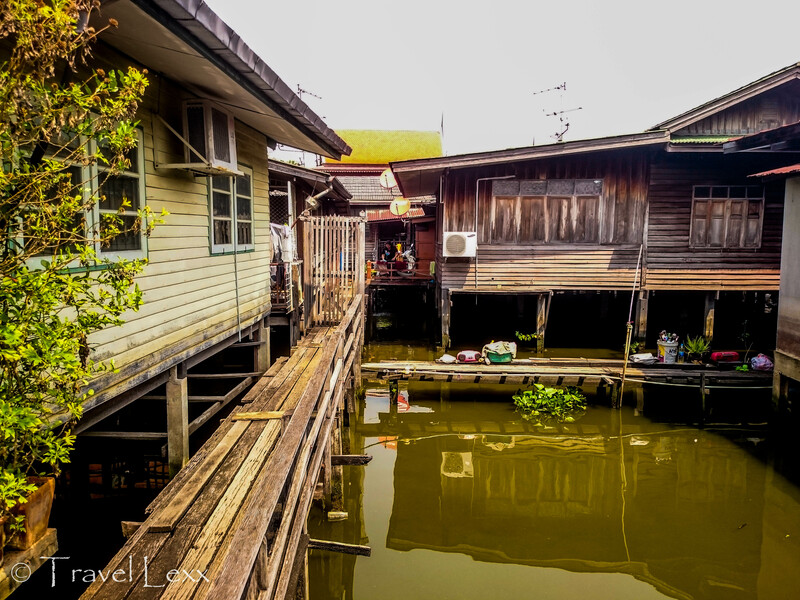 So close to the hustle and bustle of the city, yet you would never know you were in Bangkok! I love cycling when I’m traveling – as you said, it’s a great way to keep fit and see the area! This is awesome, I literally hung on every word and imagined I was there cycling with you! 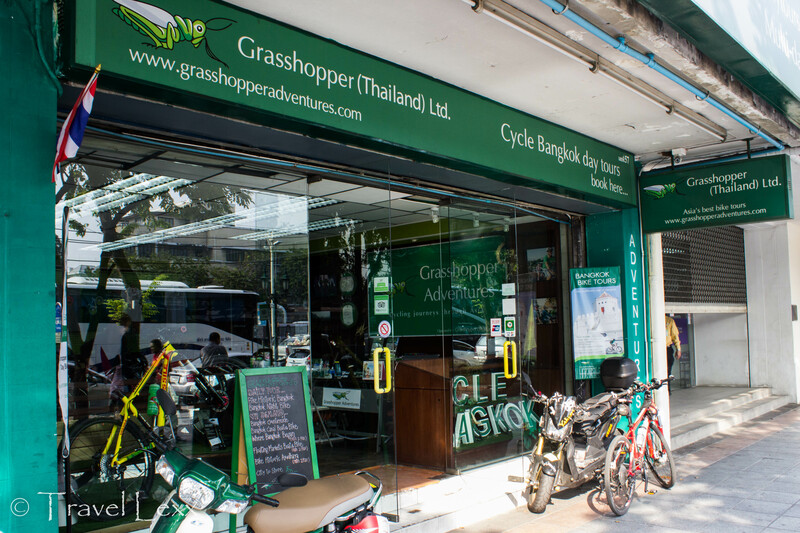 We love to go on city cycling tours and absolutely intend to do this when we visit Thailand next year for Songrkan and we will use Grasshopper – I have just checked out their website and they have many different tours to try. Pinned this for future reference. Thank you so much for this great post! Angie, glad you liked it! Grasshopper were great! I did another two tours with them in Chiang Mai which I’ll write about soon! They are not the cheapest (by Thai standards) but worth every penny! Look forward to hearing about your adventures! I always find something different to do in Bangkok. This was a fantastic day! Thanks and I hope you get a chance to do this! Your photos are amazing and it seemed like a great trip! Nice one Alexei, definitely a part of Bangkok I missed. 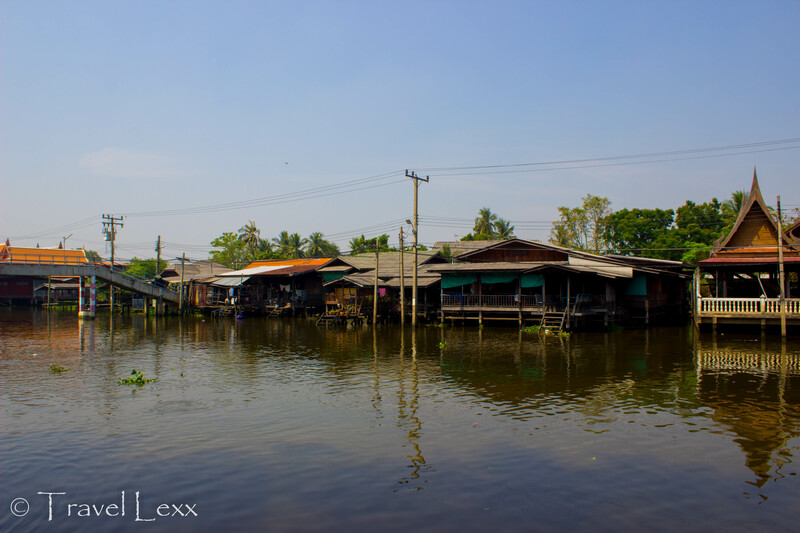 The stilt houses look really beautiful and even remind me bizarrely of ones in Panama. Cycling seems a quicker method for getting about, but I’m not sure how confident I would be on the busy streets. Wish my photos from there looked this good. Thanks David! The only slightly sketchy bit was a short ride on a fairly busy road – but it was ok! I was more worried about the narrow paths with drops into the water on each side! Great way to see things off the beaten path. It’s great you found a reputable biking company so you get the full experiences. Just to be able to see more of what the locals see makes any trip more worthwhile. Thanks for sharing! Garth, it wasn’t too bad as we started quite early in the morning and used quieter backroads but there were some near-misses! Hope you get a chance to do this in the future! What a great post, and fun tour! A good guide makes all the difference, and it sounds like you had a great one. Love the Wat Chalo – definitely unique and absolutely gorgeous! Thanks for sharing! Thanks guys! The guide was awesome and I have done other tours with these guys since! Highly recommend them! Wat Chalo was definitely beautiful! The bike tour definitely gives a different perspective of Bangkok. Last time around time constraints bound us to the beaten track. Hope to do this next time we are around there. Absolutely, Vyjay! Hope you get a chance to do next time round! I’ve been to Bangkok a bunch of times now because of work but I never knew they had a bike tour! Definitely going to try that the next time I travel there. Thanks for sharing this! Curtis, there are loads of different options! All day, half-day, night options! Definitely give them a go! So glad you enjoyed it! I love cycling tours and think it’s a great way of exploring places! Thanks!